2. Download Linq2IndexedDB library and add indexeddb.shim.js and Linq2IndexedDB.js files. We’ll generate a grid dynamically in contentHolder. btnDeleteDB is used to clear local IndexedDB. Check documentation for more about database configuration parameters. Here localStorage is used to save current revision of database. We are using Email property as unique criteria, So user can’t modify Email during editing. When user clicks on update button, getCustomer method is called to get data and InitializeUpdate sets the data in dialog’s controls. On save click in the dialog, saveCustomer method (common in both add/ edit operations) is called. In online database, we are not deleting record, only setting IsDeleted flag. 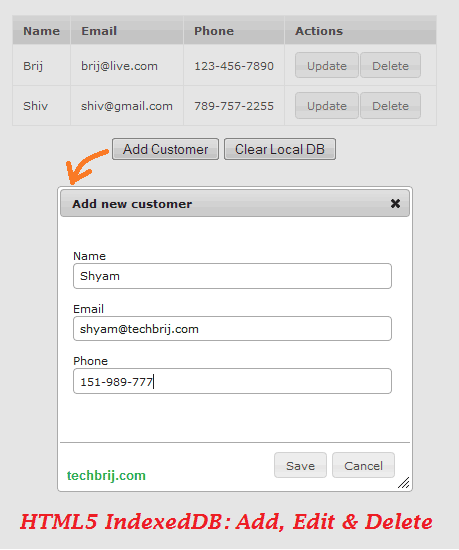 If user creates new customer with same deleted email then we have to reactivate old account and update information, that’s why, first all emails are fetched and if there is valid CustomerID OR Email already exists, update operation is performed in local database else Insert is peformed after setting CustomerID =-1 means all new inserted customers will have CustomerID -1 . We are deleting records which are created offline(CustomerID = -1) and never deployed on the server. If any server side data is deleted, we are marking IsDeleted = 1. The above method is used to clear local IndexedDB. Since older versions of IE (8 below) don’t support indexDB, what is your solution for supporting all browsers? I’m the developer behind the linq2indexedDB lib. I want to thank you for using and promoting my library. I wanted to let you know a new version is published with support for the latest version of the indexeddb shim. Another thing I want to say is that there are 2 nuget packages available for Visual Studio developers. The first one linq2indexeddb is for the web and also includes the shim. A second one is linq2indexeddbwin8 for windows 8 store apps. Thanks Kristof for this information. I’ll update it soon.